Based on the U.S. Energy Information Administration data used to develop the first graphic above, consumers in Pennsylvania and Ohio paid less for natural gas than consumers in New England, where prices are relatively higher – presumably because of scarcity of supply with limited pipeline infrastructure. 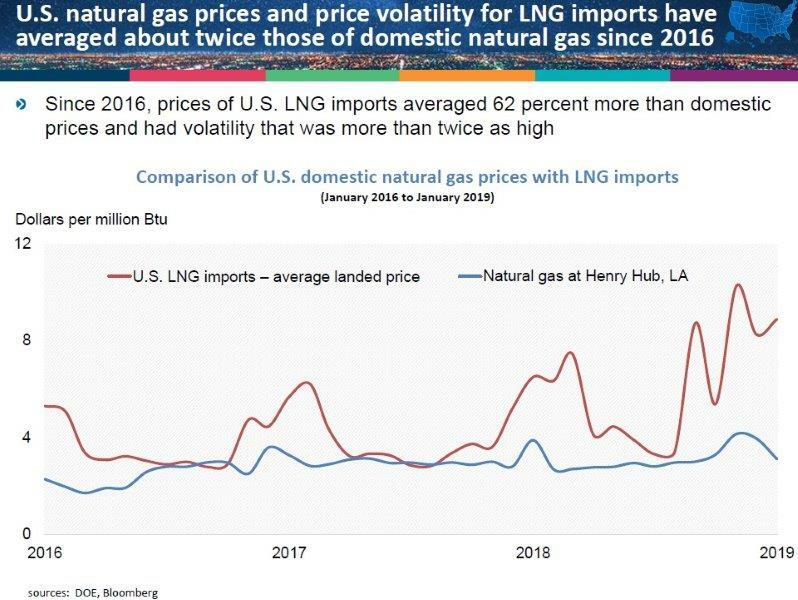 What you see above is that the average price for domestic natural gas (Henry Hub) has been relatively steady, while the average landed price of imported LNG has been much more volatile. 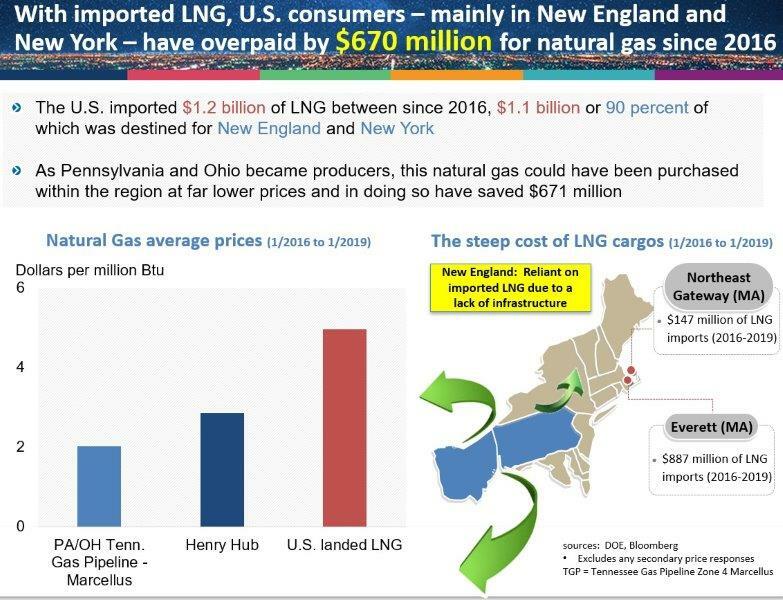 The point is that folks in NY/NE (policymakers and others) who may have reasoned that they could turn to imported LNG to help meet the region’s energy needs – we’ll just buy imported LNG when we need it – have done so at great impact to consumers. 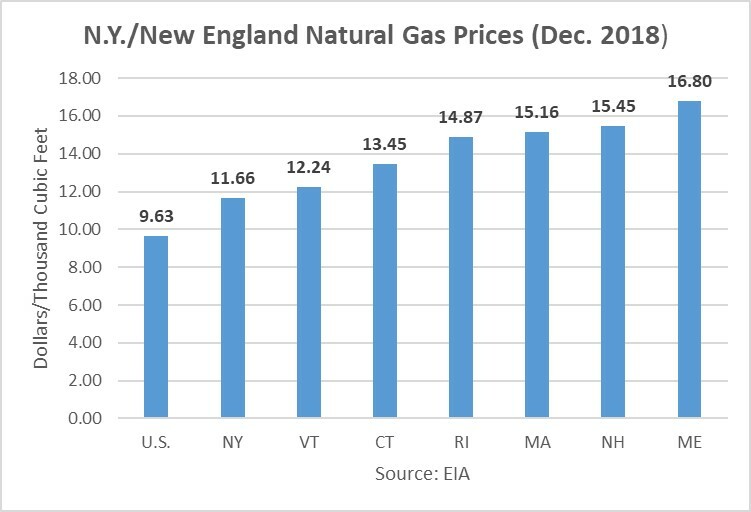 Basically, when NY/NE has needed imported natural gas, so has everyone else. We’re moving from winter to spring, so this impact may recede from the public’s consciousness. But as we’ve noted in other posts (see here and here), the region’s consumers shouldn’t continue to be penalized by poor public policy that prevents needed natural gas infrastructure. It’s not just about fuel for home heating. In December, New York generated more than a third of its electricity using natural gas, so cost impacts have been felt there as well. Instead of blocking natural gas infrastructure construction and/or expansion, policymakers at all levels in these states should consider the needs of consumers ahead of politics. Natural gas is reliable, affordable and available nearby – with climate benefits, too, as increased use of natural gas is the main reason U.S. energy-related carbon dioxide emissions have fallen to their lowest level in a generation. This annual tale of woe is one New York and New England policymakers can call to a halt by dismantling the roadblocks to needed infrastructure.